Apart from composing the celebrated textbooks of Indian mathematics and astronomy, viz. 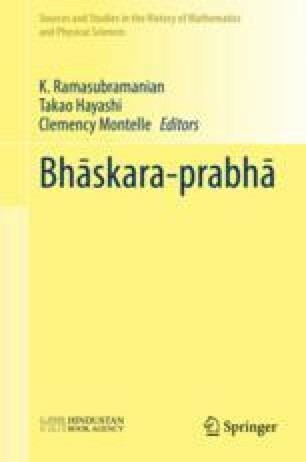 Līlāvatī, Bījagaṇita and Siddhāntaśiromaṇi, Bhāskarācārya also wrote the Vāsanābhāṣyas, commentaries which have acquired the status of canonical expository texts as they present detailed explanations and justifications for the results and processes outlined in these basic textbooks of mathematics and astronomy. From the various citations in the Vāsanāvārttika (c. 1621) of Nṛsiṃha Daivajña1 on the Vāsanābhāṣya on the Siddhāntaśiromaṇi, it appears that Bhāskarācārya first composed the commentary, Vivaraṇa, [śiDh1981a] on the śiśyadhīvṛddhida of Lallācārya.